SSDs have almost replaced the conventional Hard drives. They offer the multiple benefits you may not have found regarding hard drives. If you are thinking of opting for the best SSDs, we provide you with two best options you can give a thought about. We will make a comparison between the Samsung 970 EVO vs ADATA XPG SX6000. Well, ADATA has been one of the capable players and a popular one at that in the realm of manufacturing high-performance DRAM modules and NAND Flash products. The new offering from ADATA combines both cost and performance to arrive at the best possible configurations. Yes, we are talking about the new ADATA XPG SX6000 SSDs from the manufacturer. If you are looking to upgrade from the SATA drives and want an excellent speed performance, the ADATA SATA should indeed be your excellent choice. The SSD has been created explicitly for the gaming professionals and those involved in video rendering profession. It moves away from the SATA III interface to offer you a PCIe Generation 3×2 interface and can reach up to 1000 and 800 MB per sec of reads and write speeds. This can go a long way in ensuring faster boot, gaming and data transfer options. The SSDs are available in different options of 128 GB, 256 GB, 512 GB, and 1 TB. The ultra-fast PCIe compatibility. The rapid functionality will offer you an excellent read/write speed of 1000/800 MB per sec. You no longer need to wait for the unnecessarily longer times for your games and other data transfers. The built-in 3D NAND Flash should offer you more substantial storage functionalities, higher efficiency, and high-end reliability. You can be assured of Intelligent SLC caching and DRAM cache buffering making it an excellent option in every right. What’s more, you get a 5 years warranty making it an excellent choice for every right. We will consider the move to PCIe interface as one of the boldest ones in current times. The same price as that for the traditional SATA III interface, but an additional functionality and added advantages should make it one of the best options to opt for. Samsung has been another player that has gained a place for itself when it comes to the SSDs. It has strengthened the popular consumer range of SSDs with the launch of 970 EVO and 970 EVO Pro. The 970 EVO is the second gen NVMe SSD from Samsung. A couple of features that should set it apart from the traditional SSDs from Samsung should be the TurboWhite technology and an enhanced Phoenix controller. Like the ADATA XPG SX6000, the 970 EVO also comes with the same M2.2280 form factor. The application areas would be the media professionals, gamers and professional consumers. If you are looking for reliable performance with the high-end workloads, this should be the best SSD you would go with. The 970 EVO offers you capacities up to 2 TB. The latest NAND Phoenix controller and an intelligent TurboWrite technology offer you a great deal of 4K and 3D graphics functionality. The NVMe technology ensures sequential read and writes speeds of up to 3500 MB per sec and 2500 MB per sec. Samsung claims that it offers you as much as 32 percent faster performance when compared to the previous generations of technology. You can be assured of larger buffer sizes up to 78 GB that ensures better and faster write speeds for sequential operations. The Samsung 970 EVO is available in multiple capacities which include 250GB, 500GB, 1TB, and 2TB. All these models come with a 5-year warranty. In many of the features that these two competing SSDs offer you, you will find that they are almost equivalent to one another. One of the major differences we would find between the two SSDs lies in the fact that the Samsung comes with the MLC NAND, while the ADATA offering comes with a 3D TLC NAND. Given the fact that most of the manufacturers have been opting for the 3D NANDs and found abandoning the MLC NANDs, Samsung seems to have taken to a huge gamble. We will find Samsung facing a lot of competition on the NAND front, but even then they do have a few other features that go in its favor. The sequential read and write speeds can be one of the positives when compared to the ADATA XPG SX6000. Well, the comparison above should provide you with complete information on what to expect from either of the two SSDs from two competing platforms. 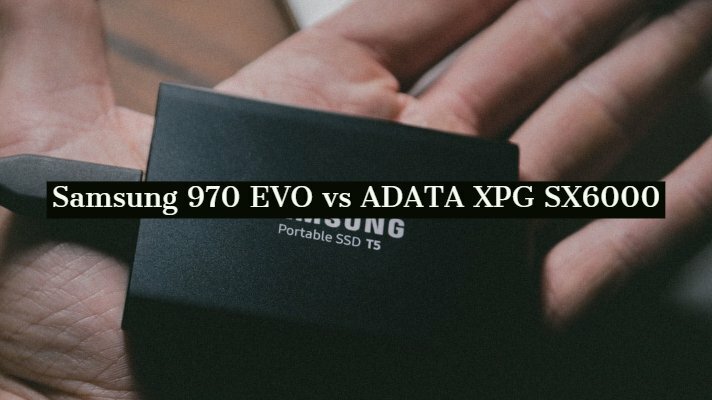 The user reviews suggest a better performance on the part of the Samsung 970 and 970 Pro when compared to the ADATA XPG SX6000. Moreover, the Samsung SSD is one of the newer options than the ADATA SSD we have been discussing. Go through your exact needs and choose the best of the two. Both SSDs have been designed for the gamers and professional users. If these are your primary needs, you can use either of them, but before that do go through your read and write speed requirements.